Chandigarh: In a bid to ‘restore the lost glory’ of Punjabi language, Punjab’s Minister for Culture and Tourism, Navjot Singh Sidhu, has made it mandatory for Tourism and Cultural Affairs department to carry out entire official work in Punjabi. Sidhu has asked the concerned officials to ensure that the working of both the departments is done in Punjabi. Stating that Punjabi language is a symbol of the identity and the pride of all Punjabi people, Sidhu also called for strict action against the violating officers. 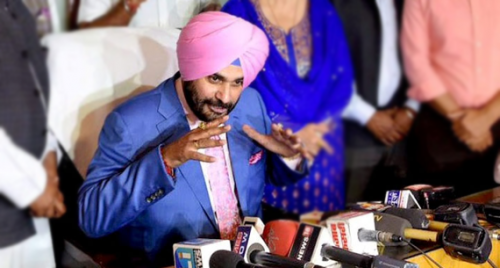 Earlier, during a panchayat summoned by Punjabi lovers in Chandigarh, Sidhu had given a clarion call to restore the lost glory of Punjabi language. “Punjabis must join hands in restoring the lost glory of Punjabi language which is a symbol of pride and identity for all of us”, he had said. The minister who has been a part of various comedy shows, had also advocated having cartoon characters in Punjabi. “Future generations, under the influence of western cartoons, is deviating from their mother tongue. So, it is important for us to have cartoon characters in Punjabi”.